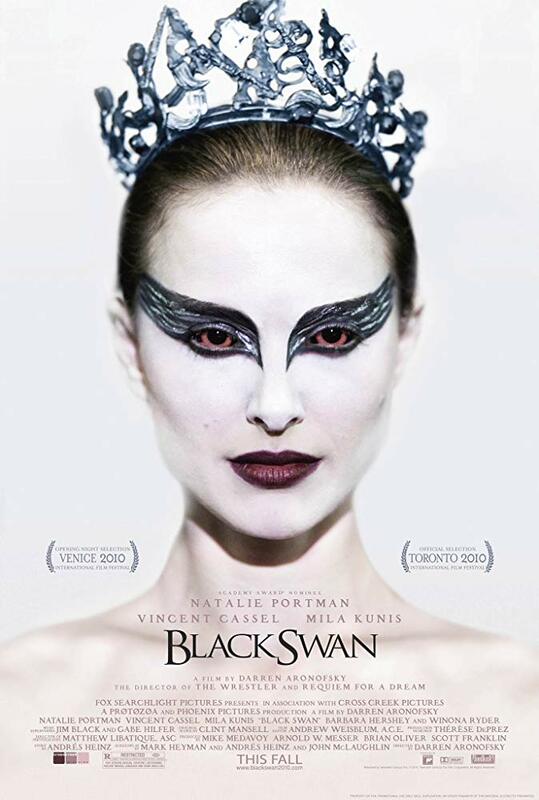 Black Swan is a deceptive melodrama told with great passion and intensity! Darren Aronosky's production is wonderfully exaggerated, as dark as it is absurd! The focus is on the performance of Natalie Portman as Ballerina, who represents the white and the dark swan in Tchaikovsky's Swan Lake. She is Nina Sayers, a young woman who loses herself in her art - even more: Nina loses her mind. Everything about classical ballet literally screams for excess: the triumph of illusion over reality, the grand gesture, even the apparent overcoming of gravity. Classical ballet demands absolute discipline and rigorous perfectionism from the dancers. These qualities outweigh normal life. The conflict between ideal and reality is the character of Nina Sayer. She has always subjected her life entirely to ballet. Her mother Erica (Barbara Hershey) used to be a dancer herself. Now they live together in a small apartment, which is furnished like a doll's house, but in reality is a prison. The mother gives her whole life to Nina's career. I wondered if she sacrificed her own career to the child? Sometimes hatred seems to characterize the relationship between mother and daughter. Nina studies with autocrat Thomas Leroy (Vincent Cassel), who has a reputation for having affairs with his ballerinas. He wants to present Tchaikovsky's classic in a new guise. We meet his former leading actress (and lover) Beth MacIntyre (Winona Ryder), who feels repressed by the younger one. She is hysterical, tends to hurt herself and we learn a lot about classical ballet through her character. Nina herself dances the white swan perfectly, but for the black one her art lacks soul. It is another dancer, Lily (Mila Kunis), who embodies all that Nina lacks: cheekiness, looseness, self-confidence - but above all passion. Lily is very sexual, but with Nina we doubt whether she ever had a date. His own plans for Nina's virginity have been made by her coach Thomas... An inner war is raging in Nina: How can she break away from her ubiquitous mother and still hold on to this almost incestuous bond? We already know this from Aronofsky: characters who destroy their own lives through their careers. Aronofsky's characters never set themselves modest goals! The actual story in Black Swan functions classically: the reflection of art in the main character, rivalry behind the stage, artistic jealousy. But Aronofsky increasingly leads us away from external events into the soul of Nina. Here the boundaries between real and Nina become blurred. The film opens with a dream and we realize that it doesn't stop, not even after Nina awakes. Natalie Portman has never before played such an obsessive character and never under such physical demands! Although she overages, we never realize that we are dealing with an actress! Everything seems amazingly real! She is especially supported by Barbara Hershey as her mother, who imposes her own goals on her "creation", her daughter. Nina's tragedy results from the fact that perfection in this one area of her life, ballet, devours the rest. It must have begun in childhood to please the mother and has damaged Nina's own ego: she herself feels no joy in life. She sacrificed herself. In the traditional ballet film, everything comes to a head in the third act and Black Swan works in the same way. All musical themes, the conflict between imagination and reality, all parallel plot strands come together in the finale. There is only one way how this nightmare can dissolve... Don't think too much about it... What is real and what is not? Here it is all about colossal effect!